2018 Bowman Chrome Baseball Hobby 12 Box Case. This Product Is Scheduled To Release On 9/26/2018. Configuration: 12 boxes per case. Following Up On Last Years Successful Reconfiguration, Bowman Chrome Resurfaces In 2018 With Chrome Prospect Autographs, Colorful Refractor Parallels, And Arizona Fall League Content Showcasing The Games Future Stars. Each Hobby Master Box contains: - 2 Mini-Boxes - 2 Autograph Cards - 1 Chrome Prospect Shimmer Parallel Card. 1 2018 Bowman Sterling Continuity Insert Card. 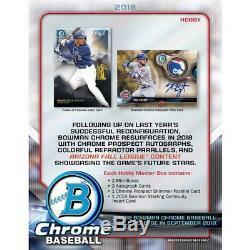 PRODUCT DESCRIPTION CHROME PROSPECT CARDS Chrome Prospect Cards are the heart of every Bowman Chrome release, and 2018 will be no exception. Bowman Chrome Prospects Each pack of Bowman Chrome Baseball will feature 2 Chrome Prospect cards. Parallels will include, but are not limited to: - Refractor: sequentially numbered to 499. Purple Refractor: sequentially numbered to 250. Blue Refractor: sequentially numbered to 150. Green Refractor: sequentially numbered to 99. Gold Refractor: sequentially numbered to 50. Orange Refractor: sequentially numbered to 25. Red Refractor: sequentially numbered to 5. Bowman Chrome Prospect Shimmer Parallel Each box of Bowman Chrome Baseball will feature 1 Chrome Prospect Shimmer parallel card. Parallels will include, but are not limited to: - Green Shimmer Refractor: sequentially numbered to 99. Gold Shimmer Refractor: sequentially numbered to 50. Orange Shimmer Refractor: sequentially numbered to 25. Black Shimmer Refractor: sequentially numbered to 5. VETERAN & ROOKIE CARDS Look for 100 Chrome Base cards of top 2018 MLB® rookies and veterans. ADDITIONAL INSERT CARD CONTENT Rookie Short Print Image Variations Featuring the biggest 2018 rookies. Also look for specially-inserted autograph parallels! Featuring a mix of elite prospect names and the biggest leapers among the top prospect lists. Parallels will include, but are not limited to: - Atomic Refractor: sequentially numbered to 150. 2017 AFL Fall Stars Highlighting the top performers and names from the 2017 Arizona Fall LeagueTM. 2018 Bowman Sterling Continuity Parallels will include, but are not limited to: - Atomic Refractor: sequentially numbered to 150. AUTOGRAPH CARDS Bowman Chrome Baseball will continue to feature autographs of the games brightest prospects. Bowman Chrome Prospects Autographs Featuring ON-CARD autographs of the games top prospects. Refractor: sequentially numbered to 499. HOBBY ONLY - Red Refractor: sequentially numbered to 5. Each Hobby Box will deliver two autograph cards. ADDITIONAL AUTOGRAPH CONTENT The following additional autograph content will be included in 2018 Bowman Chrome Baseball. Chrome Rookie Autographs Featuring the top performing 2018 rookies with ON-CARD signatures. 2018 Bowman Sterling Continuity Autographs NEW! Peaks of Potential Autographs NEW! All-America Game Autographs Sequentially numbered to 199. Prime Chrome Signatures Featuring ON-CARD autographs, from the top prospects in MLB. RELIC CARDS 2018 Bowman Chrome will continue to prominently feature the games brightest young prospects who participated in the Arizona Fall League, as well as a variety of additional insert sets. 2017 AFL Fall Stars Relics Highlighting the top performers from the 2017 Arizona Fall League. Parallels will include, but are not limited to: - Orange Parallel: sequentially numbered to 25. Chrome Auto Relics Showcasing game-used memorabilia and an ON-CARD signature from the top prospects, rookies and veterans of MLB. Orange Parallel: sequentially numbered to 25. HOBBY ONLY - SuperFractor: numbered 1/1. The item "2018 Bowman Chrome Baseball Hobby 12 Box Case FACTORY SEALED PRESELL 9/26/2018" is in sale since Monday, September 17, 2018. This item is in the category "Sports Mem, Cards & Fan Shop\Sports Trading Cards\Baseball Cards". The seller is "7stretch" and is located in Cooperstown, New York. This item can be shipped to United States, Canada, United Kingdom, Denmark, Romania, Slovakia, Bulgaria, Czech republic, Finland, Hungary, Latvia, Lithuania, Malta, Estonia, Australia, Greece, Portugal, Cyprus, Slovenia, Japan, China, Sweden, South Korea, Indonesia, Taiwan, South africa, Thailand, Belgium, France, Hong Kong, Ireland, Netherlands, Poland, Spain, Italy, Germany, Austria, Israel, Mexico, New Zealand, Singapore, Switzerland, Norway, Saudi arabia, United arab emirates, Qatar, Kuwait, Bahrain, Croatia, Malaysia, Brazil, Colombia, Panama, Jamaica, Barbados, Bangladesh, Bermuda, Brunei darussalam, Bolivia, Ecuador, Egypt, French guiana, Guernsey, Gibraltar, Guadeloupe, Iceland, Jersey, Jordan, Cambodia, Cayman islands, Liechtenstein, Sri lanka, Luxembourg, Monaco, Macao, Martinique, Maldives, Nicaragua, Oman, Peru, Pakistan, Paraguay, Reunion.